With unemployment hovering around 8.2 percent and the market flooded with applicants, it becomes easy to ignore interview etiquette. Hiring managers aren’t disregarding the advice of Miss Manners on purpose — the problem is they are more stressed and busy than ever before. A packed schedule, however, is no excuse for ignoring proper video interview etiquette. The war for talent is still raging, and even though there are more candidates in the marketplace, doesn’t mean all candidates are created equally. You need to be impressed by your candidate in a video interview, but they should also be impressed with you and your company. If they’re not, your company will miss out on the top talent they need to succeed in today’s idea-driven economy. The most important preliminary step you need to take before your live video interview is to check your internet connection to make sure it’s not lagging. It’s tough to have a stellar video interview if you’re on a faulty connection. Keep in mind you are the person who invited the candidate to this video interview, and therefore there should be no technical kinks from your end. Before conducting the interview, double-check your Internet connection and maybe even perform a test interview with a coworker to make sure everything is working smoothly. Depending on what kind of computer you’re using, you may need to adjust your web camera settings. It’s important for the candidate to be able to see your face. After all, you want your live video interview to approximate the experience of meeting in-person. It’s important both parties can see each other for better communication, both verbal and nonverbal. Since non-verbal accounts for a full 55 percent of all communication, you need to see and be seen. Conversely, make sure to position your webcam so your face is visible but not overwhelming the whole screen. You might be ready for your close-up, but candidates would prefer to see you at a professional distance. A vital piece of video interview advice given to all job seekers is to pay attention to staging. As a hiring manager, if you see a candidate’s pile of dirty laundry in the corner of their otherwise excellent video resume it will make a negative impression. The same, however, is true for you. Candidates are evaluating your company based on their research and the scant information they can glean from their video interview. Make sure to choose a clean, professional background to perform your interview. Your desk might be a mess because you’re swamped, but if it ends up in frame it’ll look like you’re disorganized instead of busy. Take some time to clean out your interviewing space and focus on making sure you have the correct lighting. You want the image you present to top talent to be poised and professional…not chaotic. The most important tip of all is to be present in your video interview. It’s easy to fall into the trap of assuming a candidate won’t notice when your attention has wandered because they aren’t sitting in the chair across from you. But candidates know when you aren’t listening — and nothing will leave a worse impression on top talent. Even if you’re the busiest person in the company, the video interview is not the time to surreptitiously check your email or glance at your phone. You might not think a candidate will notice because of the video format, but be assured they’ve made a mental note of your drifting attention span. The best way to combat this is to be 100 percent present during your video interview. Make plenty of eye contact and ask thoughtful, relevant follow-up questions. This way, when you’ve found a great candidate, you’re already well on your way to building a positive relationship. There might be more talent entering the applicant pool than ever before, but you still need to meaningfully engage in the interview to secure the best. Remember the interview is the first glimpse of the company most candidates will get. You want this to be a positive experience that will leave them wanting more. 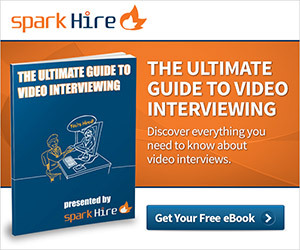 What are some more video interview etiquette tips for hiring managers? Share in the comments!